Interstate 40 proceeds west toward South Pass and Barstow from the north split with U.S. 95. 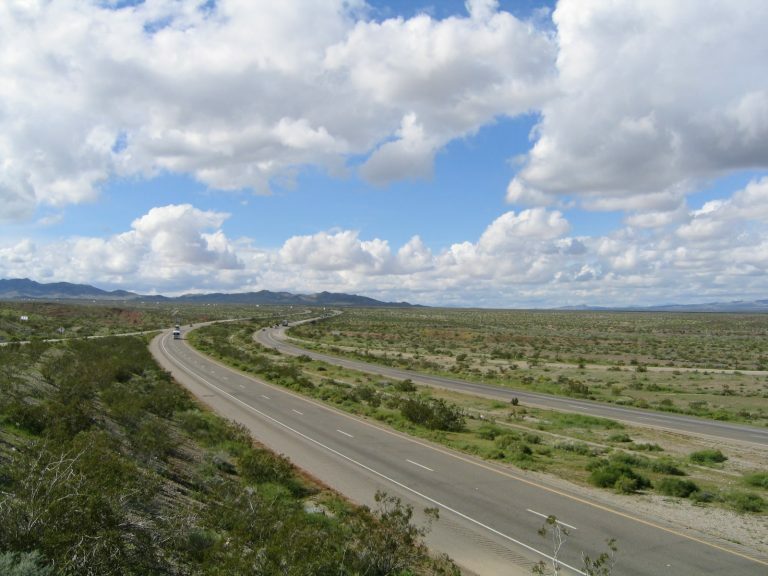 Interstate 40 is known for its sprawling, seemingly endless desert and mountain beauty. Photo taken 02/20/05. Interstate 40 begins from Interstate 15 in Barstow, and crosses the Mojave Desert on its way east to Needles and the Colorado River. Through California, the freeway parallels the route of U.S. 66, the Mother Road. It only passes through two cities: Barstow and Needles; the rest of the route is through the scenic Mojave Desert. Regionally, I-40 extends east to Kingman, Seligman and Flagstaff in northern Arizona. Snakes and other wild animals are common in the Mojave Desert, and they have been sighted even on the freeway. Signs such as this at the Desert Oasis Rest Area remind motorists who stopped at the westbound facility to be wary of such animals, especially rattlesnakes. Photo taken 02/16/04. View of the hardened lava field located north of the Desert Oasis Rest Area. Photo taken 02/16/04. Freeway entrance signage for Interstate 40 along Historic U.S. 66 east of Needles. Photos taken 01/21/02. Interstate 40 freeway entrance signage near Daggett. Photos taken 01/21/02. This Interstate 40 directional signage for Barstow and Needles is located near Daggett. Photo taken 01/21/02. Interstate 40 and U.S. 95 freeway entrance signage in Needles at the eastern end of Business Loop I-40. Photos taken 01/21/02. Northbound J Street at the diamond interchange (Exit 142) with Interstate 40 in Needles. Photos taken 03/14/09. A freeway entrance shield for the eastbound on-ramp to I-40 from Park Moabi Road. The diamond interchange (Exit 153) with Park Moabi Road is the easternmost exchange along Interstate 40 in California. Photo taken 04/01/07. This view looks north along Park Moabi Road at Interstate 40 and the Colorado River. Photos taken 04/01/07. I-40 arcs northwest from Park Moabi Road to Needles. Moabi Regional Park lies just north of the freeway here. Photo taken 04/01/07. Northeasterly view of the Interstate 40 bridge over the Colorado River from the foot of the long-since-demolished U.S. 66 Red Rocks bridge in California. Photos taken 04/01/07.